Car owners must be extremely careful when purchasing antifreeze or coolant products. After all, this is the liquid that saves the car’s engine from reaching the boiling point. There are so may coolant products you can purchase on the market, but only one or two would actually suit the type of vehicle you own. Therefore, read ahead to learn more about the best coolants or antifreeze products to use in your car’s engine without causing damage. Should You Buy Phosphate Free Coolant? Diluted with Water or Separate? 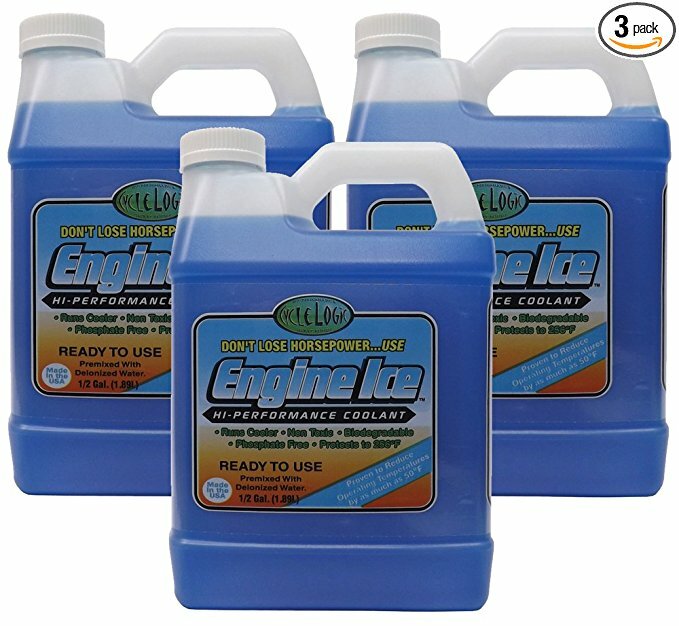 The purpose of coolant or antifreeze product is to prevent the engine from freezing over in low temperatures or prevent it from overheating in high temperatures. Coolant Compatibility— The coolant must first of all be compatible with the vehicle engine. The new coolant you buy should match the color of the old coolant in the engine. Refer to the vehicle owner’s manual for specific coolant recommendations. Boiling and Freezing Points—These two points indicate under which temperatures you can actually use the coolant. The higher the boiling point and lower the freezing point, the more versatile the coolant would be. Anti-Corrosion Features—One of the biggest caveats of using coolant is corrosion that can occur on brass or aluminum engine parts. Therefore, the coolant you buy must specifically have anti-corrosion features to combat this issue. Why we like it: Zerex coolant is inexpensive and highly effective, even in heavy-duty vehicles. This Zerex coolant, from the brand Valvoline, is designed for use in passenger cars, pickups, and heavy-duty vehicles alike. The formula works for both gasoline and diesel engines. A single gallon costs about twenty bucks. This is an excellent, cost-effective alternative to buying gallons of OEM coolant that costs hundreds of dollars. 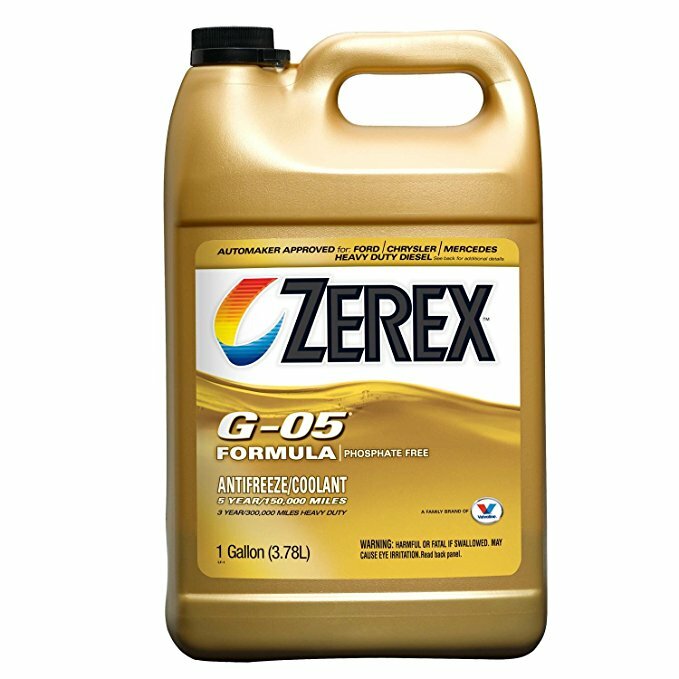 Zerex G-05 antifreeze is fully formulated from an ethylene glycol base. This is a Hybrid Organic Acid Technology (HOAT) coolant. So the color is yellow/brown. The coolant formula has a lower silicate count and reduced pH levels. It’s completely phosphate free. It should be diluted 50-50 with water to prevent overheating and freezing. For ideal corrosion protection, the recommended mix is 50 to 70 percent concentrate. What’s more, the coolant has a defoamer system that doesn’t harm plastics and hoses in the coolant system. Plus, it protects the vehicle finish. Zerex G-05 antifreeze has one of the best engine antifreeze and coolants compositions all around. 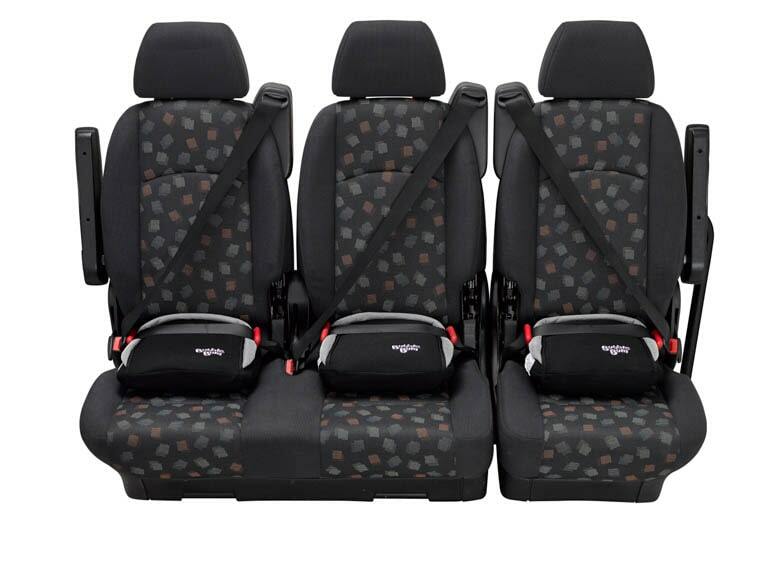 It provides solid protection up to 150,000 miles or about 5 years. The coolant is most suited for newer vehicles, such as BMWs, Mercedes MB ML500, Dodge Rams, and the new Ford Amerce models. But it works quite well in older 2007 Jeep Wrangler and similar vehicle models as well. As for the European formula goes, it protects all metals in the cooling system from corrosion. Even aluminum. This formula also includes nitrite, which protects the cylinder liners in diesel engine from cavitation. The liquid contains deposit control material that prevents mineral and scale deposits caused by hard water. We can safely say that you wouldn’t find a better formula for this price range. This coolant not only provides basic heating/freezing protection for the vehicle, it protects against corrosion and deposits as well. The high-end composition works well for newer model vehicles. The only downside is that it doesn’t have a bittering agent to protect pets in case of an accidental spill. Why we like it: It may be expensive, but no other brand can beat its high boiling point. 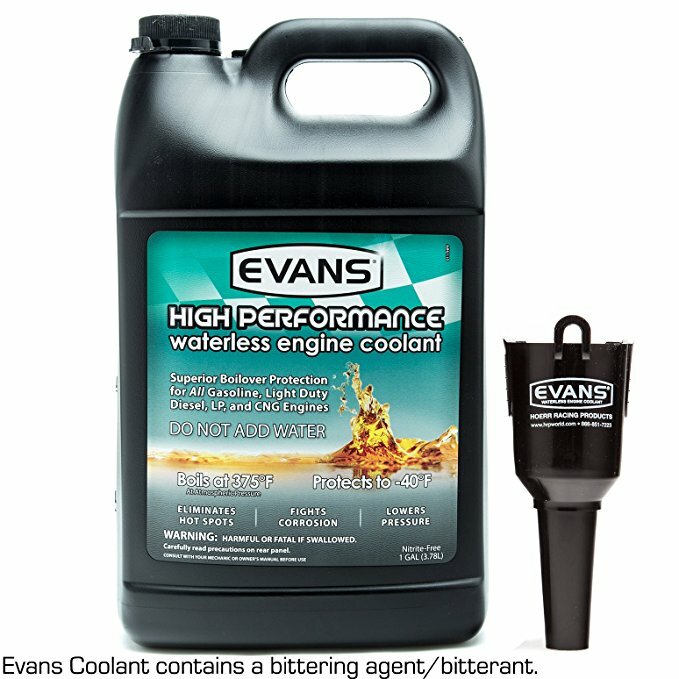 Though more expensive than other coolants you will find on this list, Evans EC53001 is god given for those who still drive gasoline vehicles. There are four types of engines this coolant is suited for: gasoline (modern, classic, or vintage), light duty diesel, LP, and CNG. This coolant formula contains no water. That means using this coolant will not cause any form of corrosion in the cooling system of the vehicle. The antifreeze has an impressive boiling point of 375 °F (190 °C). At this point, the antifreeze liquid will not vaporize, which does not cause boilover problems. The cooling point is -40°F (-40°C). That’s slightly lower than most other high-performance coolants. After the boilover point, the liquid generates vapor at only low pressure. This eliminates coolant loss, reducing the overall strain on the vehicle’s cooling system. This is definitely one of the best engine antifreeze and coolants brands out there for vehicles that tend to overheat. Think 2006 Dodge SRT8 Magnum 6.1 or the 2009 Jeep Rubicon 3.8. This coolant is well above the boiling point of many others. It doesn’t create hot spots, pre-ignition, or engine knock, making it perfect for vehicles with overheating problems. The antifreeze is propylene glycol based, which is a very nonreactive formula. As a result, the coolant doesn’t cause corrosion, cavitation erosion, or electrolysis issues. The vehicle maintenance costs will be significantly lower when using this. The antifreeze seems to last forever so changing is only rarely necessary. The only problem is that the color may vary. It’s typically yellow, but it’s recommended to flush the engine before using this coolant for the first time. The EVANS EC53001 antifreeze is a chemically stable formula perfect for owners of vehicles with overheating issues. It requires exactly zero water so corrosion issues won’t crop up. It may cost about fifty bucks per gallon, but the long-term benefits are well worth the price. Why we like it: This antifreeze can optimize the performance of high-functioning engines, such as those in race cars. This high-performance coolant can be a game-changer for those looking for a formula for driving in very hot or cold environments. Engine Ice TYDS008-03 is definitely not the antifreeze you can find on the street. It’s phosphate free and is labeled non-toxic. This antifreeze is a propylene glycol base formula, which is less toxic than the more common ethylene glycol. Because it’s phosphate free, this formula is considerably more biodegradable. The formula comes pre-mixed with water that has been de-ionized to reduce the risk of corrosion. There’s no need to add water at home. The risk of mineral, scale and other deposit buildups in the coolant system is arguably less with this formula. It provides freeze protection down to -26°F (-32°C) and boilover protection up to temperatures as high as 256°F (124°C). Arguably, it’s not as high as the EVANS EC53001, but this is still impressive, given that this formula works on motorbikes as well. Thanks to the high boilover point, this antifreeze formula is perfect for race bikes, ATVs, snow machines, and vehicles that drive in desert conditions. The label on this product says that it reduces the operating temperature of the engine. It doesn’t, but it can keep an engine running even on the hottest summer day. This coolant has CCS and ASRA permission to be used on racing tracks, in fact. It effortlessly keeps engine performance at optimal levels. However, the formula is blue, so it shouldn’t be used right away. The engine would require a thorough flushing before using this formula. The price per gallon is on the more expensive end, however. It has a lower boilover point than the EVANS EC53001, but it costs a few dollars more. Engine Ice TYDS008-03 is biodegradable and less toxic to children and pets. It requires no water and can be readily used out of the can. What really makes the formula worthwhile is the high boilover point. 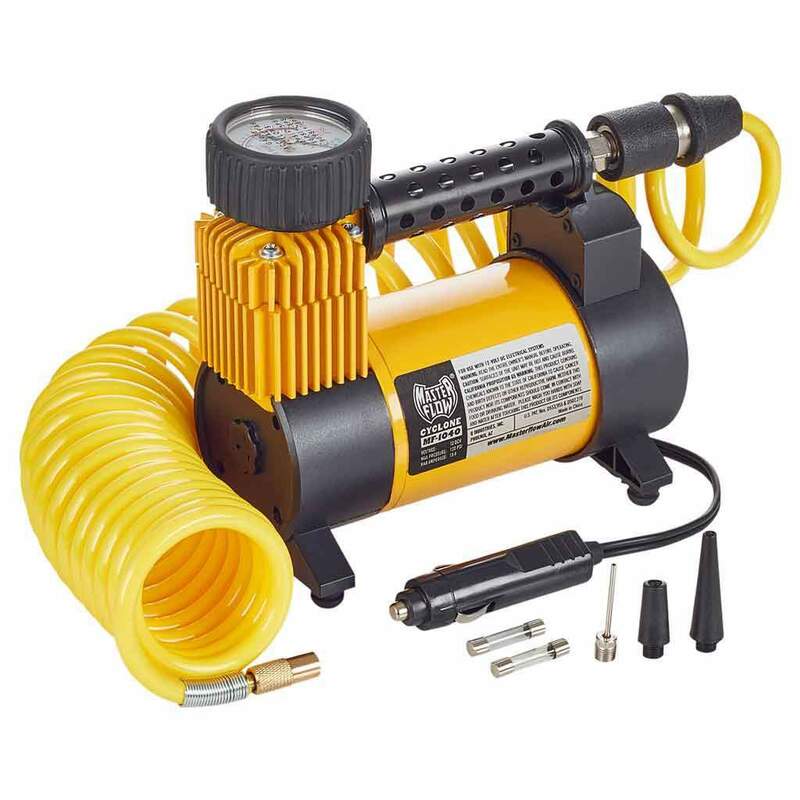 It’s truly perfect for vehicles that need to be driven fast in hot climates. Why we like it: It’s one of the best OEM coolant formulas around that doesn’t cost an arm and a leg. The Audi coolant is one of the best-quality OEM formulas available in the market. The color of the coolant is pink or lilac. It’s mainly designed for Audi or Volkswagen vehicles, but other vehicles that already run on pink or red coolant can depend on this formula as well. This antifreeze is a classic ethylene glycol-based formula. It’s aluminum compatible and doesn’t harm cooling systems with alloy inside. The formula is designed to be used all year round. It will reliably protect the engine against frost and overheating. The liquid protects against corrosion and calcium deposits in the cooling system. It’s suitable for G11, G12, G12 Plus, and the newer G13 engines as well. The coolant has to be mixed with water, as it’s a classic formula. As long as you avoid using hard water with high-risk of deposit material, this coolant would work wonderfully in gasoline, diesel, and propane engines. Keep the dilution formula at a 50/50 ratio. This antifreeze works as advertised in both cars and lightweight trucks. The antifreeze provides protection against -35°F (-37°C) cold temperatures and has a 277°F (136°C) boilover point. Audi drivers can actually choose a newer type of coolant made for G13 engines. But performance-wise, this coolant is best to stick with. This coolant is backwards compatible with G12 engines. There’s no need to do a complete flush replacement unless you are starting with a G13 engine. However, this coolant doesn’t have some properties drivers expect from newer formulas, such as phosphate-free liquids. The coolant has decent freezing and boilover protection. 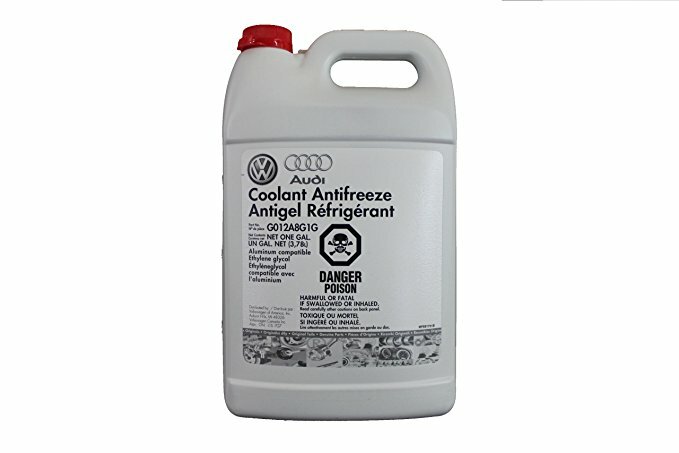 It’s nothing fancy, but this is the right coolant to use in the Audi and Volkswagen vehicle models. This Audi OEM antifreeze is the most economical option for recommended vehicles as other brands tend to be quite expensive. Given the nature of the formula, the price is well worth it. Why we like it: This is one of the most classic coolant formulas that continue to be popular to this day thanks to its low price and high effectiveness. 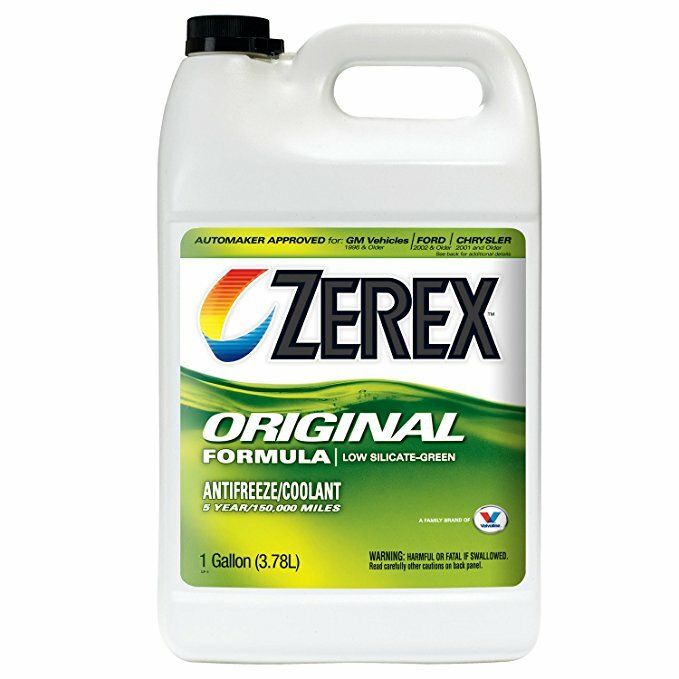 The original Zerex antifreeze is compatible with all vehicles that can use a glycol-based coolant. It can be used in vehicles from passenger cars to long-haul trucks. The formula is time-tested and continues to be popular to this day. It is also one of the most economical coolant brands out there. The original Zerex coolant is made using ethylene glycol with low amounts of silicates. It’s green in color and works with engines that require traditional yellow or green coolant. The formula has an organic acid corrosion inhibitor that protects against rust or corrosion issues. The coolant provides extended engine protection. It’s best used for cold temperatures as it provides protection for cool temperatures down to -34°F (-37°C) and boiling point up to 250°F (121°C). The Zerex original coolant has been the go-to antifreeze for drivers of all vehicles for decades. This coolant is necessary if you are using an older American or European vehicle model. For vehicle engines with copper core radiators, traditional green coolants like this are the best. The chemical formula does break down with prolonged use, so you need to flush the engine every 2 or 3 years. One disadvantage is that the short lifespan of the coolant increases the risk of corrosion inside. Then again, for coolant systems with brass or copper, newer OAT or HOAT formulas will not do much. With recommended changes, this antifreeze can be used for over a decade in vehicles. While there’s nothing fancy to boast about here, this coolant is known to be highly reliable in temperatures during both summer and winter. This is one of the best antifreeze formulas for engines with more than one metal present. It’s highly economical and can last long with frequent changes. If you have an older vehicle model, there’s no other option than this low-silica green liquid. We’ve found that this time-tested formula has never let us down. 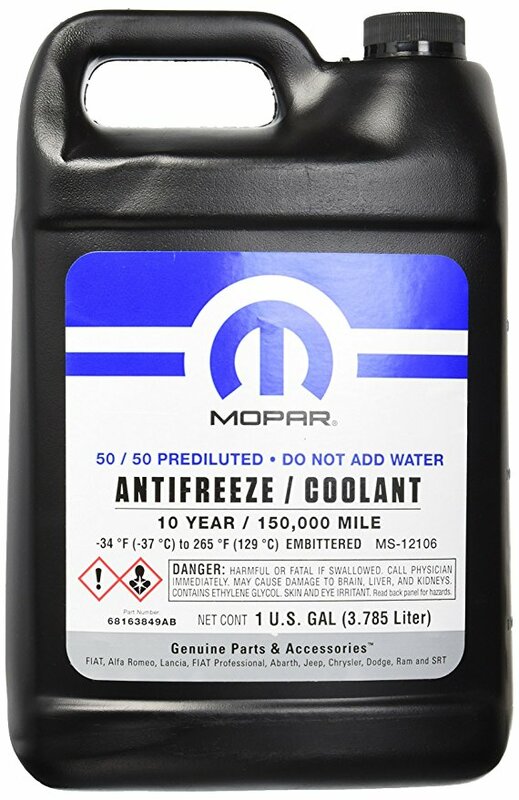 Why we like it: Mopar OEM antifreeze is the best coolant for recommended vehicles, and it has a very long lifespan. This OEM coolant is recommended for vehicles like FIAT, Alfa Romeo, Chrysler, Jeep, Dodge, Ram, SRT, and several others. The coolant comes in a 1-gallon can that is priced at only twenty bucks. It’s highly affordable and is perfect for the recommended vehicles. The coolant provides anti-boil and cold protection at -34°F (-37°C) and 265°F (129°C) degrees. The Mopar formula is made from monoethylene glycol using Organic Acid Technology (OAT). Therefore, this coolant is free of phosphates and silicates. OAT formula coolant is the newest type of antifreeze recommended for the latest vehicle models. The formula includes various corrosion inhibitors, which extends this coolant’s shelf life well beyond the average. This coolant comes premixed in a 50/50 ratio. There is no need to add water. 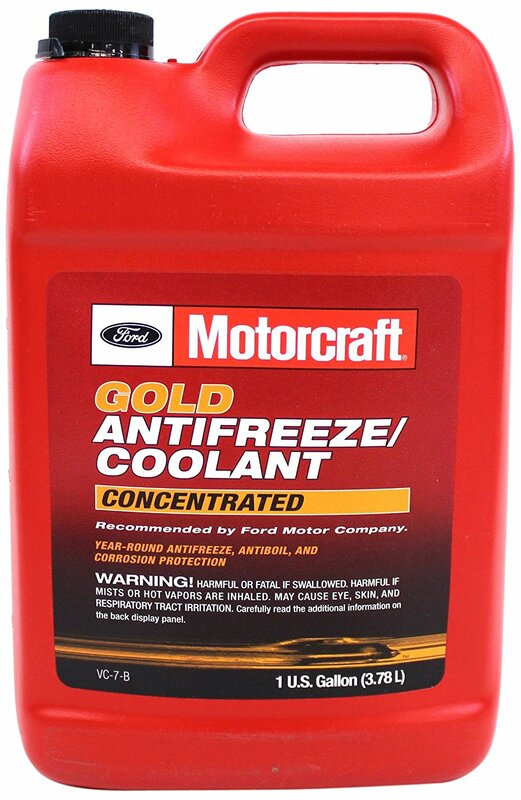 This is the perfect coolant for any vehicle requiring OAT MS12106 antifreeze. It comes conveniently pre-diluted so there’s no need to worry about introducing hard water deposits or iron into your vehicle’s cooling system. While it’s easy to handle, drivers should take particular care not to mix this coolant with HOAT or any other type. It will result in gelling and the need to flush out the whole engine. This coolant is surprisingly long-lasting. However, the manufacturer specifies to flush out the coolant every 150,00 miles, or every 5 years. Because the formula uses anti-corrosion additives, the metal parts can experience wear with prolonged use. Therefore, it’s absolutely necessary to flush out the engine as recommended. The freezing and boiling points are rather decent. Nothing special, but it should get the job done under normal driving circumstances. Don’t use this in older cars unless the owner’s manual specifies it. This is a solid product that offers excellent value for the money. If you are looking for OEM coolant, then this is definitely the product for you. Why we like it: Affordable and high performing, this classic green formula is great for a variety of vehicles including motorbikes. 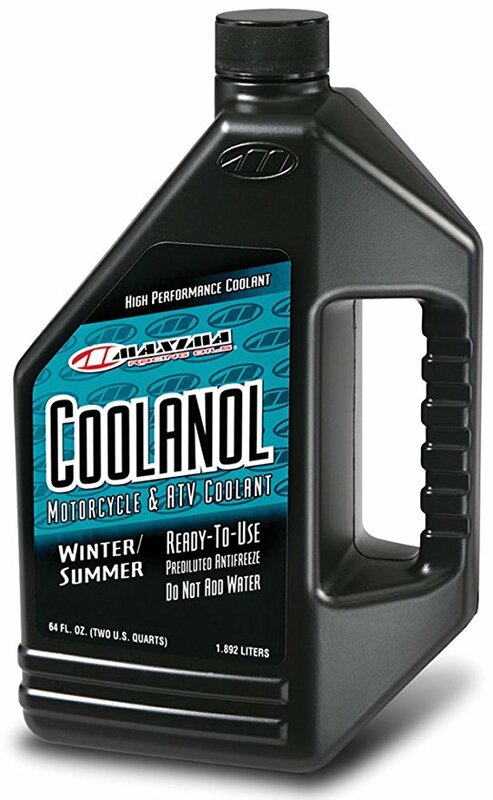 Though not a well-known brand, Maxima Coolanol is a solid coolant for recommended vehicles. It works for cars, ATVs, motorbikes and many other vehicles. The green antifreeze has a classic ethylene glycol based formula. It’s highly recommended for motorbikes, including street bikes and some racing bikes. The product is available in small 64 Fl cans priced less than twenty bucks. The product is highly affordable overall. This antifreeze comes premixed with deionized water at a 50/50 ratio. The formula contains very low levels of silicates, so it’s very safe to use with aluminum radiators. The blend has corrosion protection additives. So it can be used in bikes and other vehicles with alloy and magnesium parts inside. This particular antifreeze also includes anti-foam agents. These additives reduce water pump cavitation, which results in an increased cooling capacity according to the label. The actual protection points are at -34°F (-37°C) and 265°F (129°C). So it’s decent to use all year round. However, don’t expect superior cooling capacity. It can do a decent job with a 15lb radiator cap, but the boiling point isn’t high enough for extreme climates. Plus, it contains a bittering agent. The agent will prevent the otherwise sweet coolant from being appetizing to kids and pets. One downside to this coolant is the small-sized cans. If you have a commuter bike or a car, you will have to purchase them in bulk, which can cost up to a hundred bucks. This is a great replacement antifreeze if you want to switch to something other than OEM liquid. 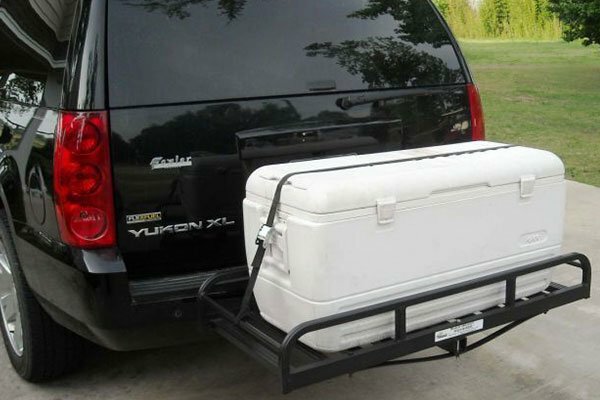 It’s great for vehicles other than cars, such as ATVs and snowmobiles as well. The product is well formulated with modern needs in mind. It contains no additives that would require constant flushing out of the engine. Besides, it keeps the metal parts of the engine free of corrosion. Why we like it: Definitely one of the best OEM coolant formulas for motorbikes and four-wheel vehicles. This is a brand new antifreeze coolant formula from Honda for motorbikes, ATVs, UTVs, snowmobiles, and similar smaller vehicles. The genuine OEM formula is surprisingly affordable. It comes ready to use in one or two-quart cans. This genuine OEM antifreeze comes in a ready to use, already diluted 50/500 formula. The formula is blue, but it is uniquely compatible with the original green coolant. If you have been using green antifreeze and want to switch to this formula, you can do so without flushing the engine. However, we do recommend an engine flush anyway if the coolant you are replacing is not genuine OEM or Honda branded. The formula contains a non-abrasive corrosion inhibitor. Meaning that the formula would protect your vehicle’s engine from corrosive influences. It has a freezing point at -34°F (-37°C) and a boiling point at 265°F (129°C). This is similar to what you may find in cars. For motorbikes, the boilover point is particularly impressive. At that protection level, you can use this coolant even in racing bikes. Interestingly enough, note that the anti-rust additives in this formula are non-abrasive. You won’t have to keep flushing the engine because of that every two or three years. If you have a small bike, then this formula would be highly economical for OEM quality. It can be used with bikes of other brands as well since other manufacturer’s use this coolant formula quite often. The cans come in small capacities. If you have a larger vehicle, you will have to buy multiple cans at once. This is hands down one of the best engine antifreeze and coolants for small transporters like ATVs. The OEM-quality plus price is nearly unbeatable. It escapes the usual trappings of coolants of this kind that require an annual engine flush. The non-abrasive nature of the coolant makes it rather long-lasting inside the vehicle. Why we like it: Possibly the best coolant available that is not OEM for Asian-made vehicles. Vehicle coolants largely differ based on the overall model of the car. Asian-made cars use very different blue and red coolants when compared with American and European cars. So far, the gold standard in red coolant for Asian-made cars was Toyota OEM. 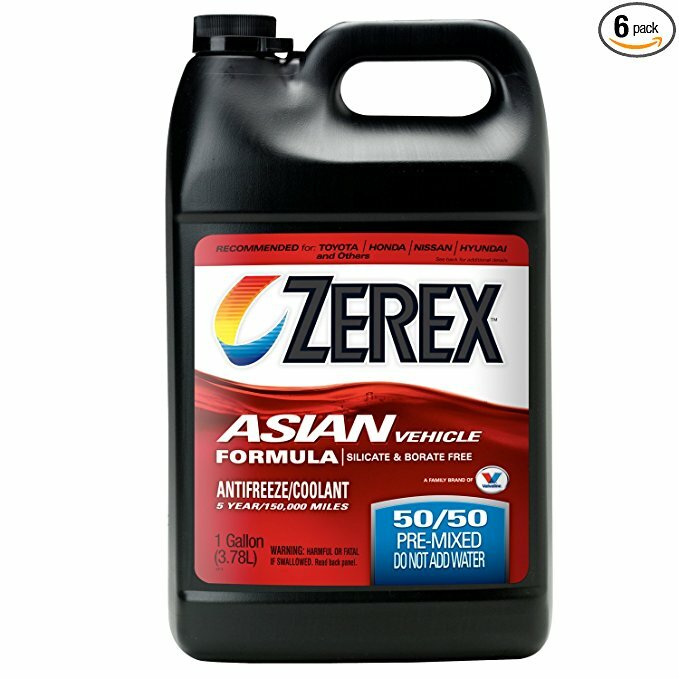 Afterward, Zerex produced the best non-OEM red antifreeze for Toyota, Scion, and Lexus car models. 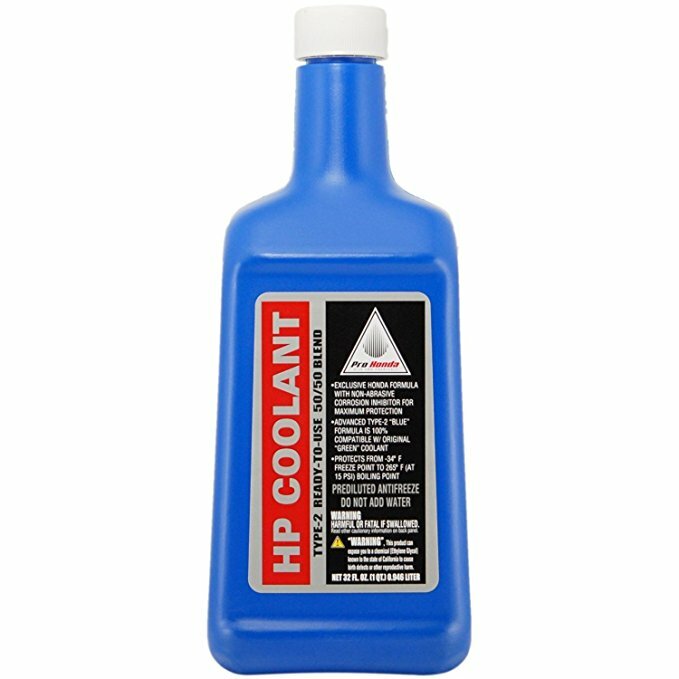 This coolant is highly compatible with many Asian car models and cooling systems. The Zerex actually meets all the specifications of the Toyota OEM liquid. This formula is made from ethylene glycol, diethylene glycol, sodium benzoate, and water. Yes, it’s pre-mixed with demineralized water so there’s no need to add water later. This antifreeze impressively meets the rather stringent standards for red coolant. Toyota, for example, specifies a non-silicate, non-nitrate, non-borate, and non-amine coolant. The Zerex red is silicate and borate free. It includes corrosion inhibitors and defoamers to keep the meticulous Asian engines clean. This antifreeze is definitely one of the best out there with genuine OEM coolants when it comes to performance in Asian vehicle models. It is long-lasting and can last for decades. But because of the anti-corrosion material, you will have to flush out the engine every 5 years or 150,000 miles. It does have a bittering agent though, which will keep pets and kids away from the coolant. Do note that the color of this coolant is red, not pink. Do not confuse this with lilac, light red, or pinkish coolant liquids required for some American and European cars. One big caveat is the price. This coolant can cost as much as $60 per gallon. The OEM Toyota product is actually a few bucks less per gallon. However, this red coolant is much easier to find than the original Toyota OEM coolant. This is definitely the perfect coolant for Asian-made cars that require red liquid. It’s expensive but readily available. If you can’t find OEM red coolant, then this brand would be a good choice. Why we like it: A great yellow coolant concentrate with a long life and anti-corrosion properties. The Genuine Ford VC-7-B Gold Concentrated coolant is suited for ATVs, utility vehicles, and similar cars. It’s also made for off-road, street sport, cruiser-style, and touring motorcycles. The manufacturer has okayed this coolant to be used in marine personal crafts and snowmobiles as well. This coolant is ethylene glycol based and is yellow/gold in color. It’s made to provide antifreeze and anti-boiling protection year-around through all seasons. Indeed, Genuine Ford VC-7-B does offer protection against corrosion. The coolant includes a bittering agent. This brand can be used in both diesel and gasoline engines. Genuine Ford VC-7-B should be diluted 50/50 with water. It’s highly recommended to use distilled water for best dissolution. The coolant liquid is highly concentrated. It should not be used without dissolving as recommended. The diluted coolant offers freeze protection for as low as 34°F (-37°C) and boiling protection for as high as 265°F (129°C). In other words, it should do the work in winter or summer. The bittering agent will keep kids and pets away from the colorful liquid. The coolant is quite unpalatable so there’s no risk of little Foogie lapping it up. As always, never mix this coolant with any other coolant of a different colour. The coolant works great with Ford vehicles, but it may not do the same for similar auto brands. The Genuine Ford VC-7-B is a high-quality OEM coolant. It’s reasonably priced and works as advertised. It’s impressive in the corrosion-protection it offers. Yellow coolant has tiny silicates that increase corrosion resistance for compatible vehicles. The coolant is quite perfect for Ford vehicles. However, don’t use it in non-Ford vehicles without checking the manual first. Technically, any type of coolant can run inside an engine given that it doesn’t cause damage to the metal coils inside. But if you browse through all the available coolant products in the market, you will see a never-ending list of features that includes colors, additives, brand names, and boilover points. First of all, check out the owner’s manual that came with your vehicle. Find the type of coolant recommended by the manufacturer. This is the coolant you need to purchase for your vehicle. Do not switch to a different brand or a different type of coolant if it’s not explicitly stated in the vehicle owner’s manual. You can choose between different brands of the same product, but not different types of coolant. If you are not sure if a coolant is compatible with the model of your vehicle, email the manufacturer and ask about it. If you accidentally use the wrong coolant in your car, you risk severely damaging the engine and cooling system. Most manufacturers offer a list of vehicle modes compatible with the coolant. Therefore, checking this shouldn’t be too difficult. OEM refers to original equipment manufacturer, which in this case is the maker of your car. Nearly all automotive brands such as Ford, Toyota, Nissan, and Audi produce OEM coolant for the cars they make. OEM antifreeze is considered the best-suited product for your vehicle’s cooling system. However, OEM products can be unnecessarily expensive and may even be unavailable. In that case, it’s not unreasonable to switch to a generic brand, given that the new product you purchase meets all the standards for antifreeze as recommended by the carmaker. Generic antifreeze is not generally considered inferior to OEM liquids. In fact, some of the most popular coolant brands, such as Zerex, are generic. You may have noticed that coolant liquids come in different colors. This is not a gimmick. The color of the coolant is actually important when it comes to choosing the right product. Different colored coolants indicate that the formula is generated in a manner that is chemically different. You should never mix these. Namely, don’t ever mix different colored coolants in the engine. The two different chemical formulas would react with each other and cause the product to turn into a gel-like substance that clogs up the cooling system. If you are choosing a different colored coolant than the one you have been already using, first you need to check if it’s compatible. If it is, don’t use the new coolant without flushing out all the old coolant from the engine. IAT coolants are made using ethylene glycol. This type of coolant is used by American cars made from the 20s to the 90s. Hence, most people are familiar with the classic yellow or green color of this coolant. IAT coolants contain additives silicates and phosphate. The aim is to prevent corrosion in the engine. However, the material can also cause abrasions, which is why these coolants need to be flushed out following a certain period of mileage. OAT coolants are mainly distinct from IAT by not having any phosphates or silicates in the liquid body. The organic acids contain corrosion inhibitors that can as effectively keep rust at bay. You will commonly find OAT coolant in new cars. The coolant is available in colors ranging from dark green to orange. HOAT coolant formula includes silicates as additives. The main function of these silicates is to prevent corrosion in the alloy parts of the engine. For that reason, HOAT coolant should be flushed out of the car every 5 years of 150,000 miles. Whether your vehicle needs HOAT, IAT, or OAT coolant would depend on what the manufacturer recommends. Therefore, always follow instructions. You may have noticed that some high-performance coolants proudly proclaim to be phosphate free. What does that mean? Phosphates help in removing corrosion and deposits. But these chemicals kill microscopic life forms making the coolant not as biodegradable as it should be. Coolant liquid is extremely toxic. But it also smells nice and may look rather appetizing to toddlers and pets. Therefore, it’s highly recommended to use a liquid that comes with a bittering agent. The agent makes the coolant taste better, so pets or kids won’t lap it up if they come across the cans. Newer coolants are made from propylene glycol, which is considered less toxic to small children and animals. Coolant liquid needs to be diluted with water to actually work in the car. The problem is, if the water you dilute the liquid in contains ions or residue, it would cause corrosion and depositions. For this reason, mainly, it’s more convenient to purchase coolant that is already mixed with water. However, it may not be possible with some brands. If the coolant is produced by the OEM, then it would meet the auto industry standards for coolant. However, there may be other safety standards you might want to meet. Some coolants are banned under California’s Prop 65 law for harming the environment or posing a threat to animals and children. You can obtain these banned coolants in your state. However, it’s best if you don’t, for the sake of your overall safety. The kind of fuel the vehicle’s engine uses, whether diesel or gasoline, also affects the coolant you should use. Diesel engines, for example, may contain brass or aluminum parts in the engine prone to corrosion. Therefore, some coolant types may be preferable over others. However, the vehicle owner’s manual should contain this information. The recommendations made in the owner’s manual would take fuel type into account.